'Tis the season for many things . . . including end-of-the-year lists. You'll want to check these lists twice to make sure you didn't miss any of the year's best. And, finally, here are our favorites of 2015. These are books that we read, loved, and shared again and again. We whole-heartily recommend these doggone good books. Most teenagers won't remember ten years ago when Hurricane Katrina pounded New Orleans, after they read Don Brown's account in Drowned City, they won't likely forget it. The account starts with an African breeze that grows to a category three storm over the Atlantic. By the time Katrina hits just east of New Orleans, it has slipped to a category three storm, but still it breaks levees, floods the city with one million gallons of water per minutes, and leaves 80% of the city under water. In this graphic novel readers see the dramatic story unfold across the pages. Illustrations of people standing, slumping, leaning, and trying to escape the water are filled with desperation and humanity. And it's the impact of the storm on those people that drives the story. We see 20,000 people packed into the Superdome with no electricity, no sanitation, and insufficient food and water. We see a man hold a baby above the floodwaters as he tries to escape. We see a couple race up the stairs of their home just ahead of the water. They use a knife to scrape a hole in the roof and get out just in time. We see people stranded on rooftops surrounded by rising floodwaters. And we see those that don't make it. Brown brings readers right into the disaster, recounting the many failures: 360 city buses don't show up to evacuate residents; empty trains leave the city; police abandon their post; there is a lack of communication and coordination between government agencies; there is looting and shooting; more than 1400 people die. He also describes the rescue efforts of individuals and agencies. Despite stagnant water teeming with garbage, oil, poisonous snakes, and dead bodies, more than 40,000 people are rescued. This accessible account leads readers into complex ideas and questions. What could the government have done better? Where does responsibility to protect people from natural disasters lie? How far should society go to protect individuals who choose to stay in harm's way? What role did race and poverty play in the government response to the disaster? Brown incorporates quotations from survivors and includes meticulous annotations and bibliographic information. This is a power book. I've always admired the Danish Resistance during World War II, particularly the heroic transport of most of the Danish Jews to Sweden before they could be rounded up by the Nazis. What I didn't realize until I read this book is that the Resistance had a slow start. While fearful and overwhelmed adults in Denmark capitulated to German demands, a small group of young boys fought back. 14-year-old Knud Pedersen and his brother Jens, along with a few of their friends, were disgusted with Danish leaders, and admired the way Norway was fighting against the German. In broad daylight, they fought by twisting traffic signs and spraying walls with blue paint. Their activities escalated to sabotage, arson, and stealing weapons. 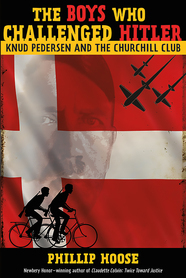 They called themselves the Churchill Club and their actions inspired others to resist and the Danish Resistance grew. Engrossing from page one, Hoose's account is based on extensive interviews with Knud Pedersen. When George Soper was hired to figure out the source of a typhoid outbreak that infected six members of the Warren household in 1906, his investigation led him to Mary Mallon, a cook who had infected at least 24 people. Mary turned out to be the first documented healthy typhoid carrier in the United States. In this highly readable biography, Susan Campbell Bartoletti looks at Mary's plight. She was not just "a living culture tube" or "a chronic typhoid germ producer" as George Soper called her, but she was also an intelligent, fiery tempered, fiercely private, independent, Irish woman who didn't accept Soper's assertion that she was making people sick. This book and Gail Jarrow's superb book, Fatal Fever: Tracking Down Typhoid Mary, look at the same subject. While Jarrow follows Soper's investigation of the medical mystery, Bartoletti's focus is on Mary. Together these books make an excellent choice for student analysis of the different approaches authors take in texts with the same topic. If the stories that Micah's grandfather told him are true . . . if there really is a place where an elephant named Big Jean can do long division, where a French vulture can tell the future, and where an illusionist can make you fell the frosty winds of Antarctica while you sitting in your chair . 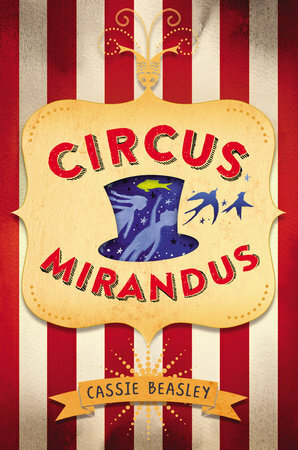 . . if Circus Mirandus is an actual circus . . . then "that [means] magic [is] real" . . .(17) and maybe, just maybe, magic can save Micah's dying grandfather. When Micah's grandfather, Ephraim Tuttle, visited Circus Mirandus as a boy, the Man Who Bends Light promised him a miracle. He's been saving that miracle for a time when he really needs it, and that time is now. Micah is certain that if he can get into the circus and talk to the Man Who Bends Light, the Lightbender will save his grandfather. In alternating chapters, a family mystery slowly unfolds just as the tension in Micah's story builds, creating suspense that will keep readers turning pages right up to the end. This story is just the right blend of the fantastic and the sometimes difficult realities of the real world. 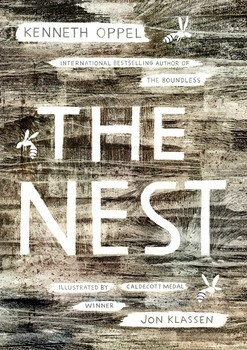 The Nest came out just a couple of weeks ago, and it already has racked up five starred reviews. It is deliciously creepy, not in a blood-and-gore kind of way, but in a get-inside-your-head kind of way. Steven has been coping with anxiety and bad dreams for a while and now there is more tension at his house because his newborn brother has a rare congenital problem. Even though his therapist assures him that "what happens in a dream stays inside the dream," Steven's latest dreams with creatures of light that promise to "make things better" seem all too real. (110, 23) And in some ways, he wants them to be real. The first-person telling puts readers right into Steven's thoughts as he struggles to figure out what is a dream and what is reality. That ambiguity makes this a psychological thriller that you'll read in one sitting. (I did.) Oh, and the villain is the most chilling I've met in a long time. I bet it'll change the way you feel about wasps. Laura Amy Schlitz describes her new book as a "good old-fashioned story" and that is exactly what it is. Since her mother's death, 14-year-old Joan does all the woman's work on Steeple Farm, and it's hard work: she takes care of the chickens, cleans out the privy, cooks meals for her father and four brothers, does laundry, and puts food by. When her father decrees that she can no longer attend school and then burns the few books she owns, Joan decides there is nothing left on Steeple Hill for her, and she goes to Baltimore to become a hired girl. She has little idea what she is getting into, but she is desperate enough to take a chance on a better life. In Baltimore she begins a very different life working for a Jewish family. While she enjoys the conveniences of electricity, hot and cold running water, a dumbwaiter, and a carpet sweeper, Joan works to learn the Jewish rules of kashrut and appease cranky Malka. But it is the more universal experiences that change her. She learns to respect people's differences. She learns about men who are, thankfully, not all like her father, and gets her first kiss. She learns about meddling (not a good idea to pass on a love sonnet you found to help a relationship along), heartbreak (things don't go well after that first kiss), and forgiveness. Written as a series of Joan's diary entries, the story is set in 1911 and the relevant social issues of the time--women's rights, class division, religious prejudice, and labor rights--are addressed. Historical details and content infuse seamlessly into the story; readers will feel like they've been picked up and placed right in Joan's world. Miyares is fairly new to picture books (his first illustrated book came out 2010), but boy, does he know what he is doing! 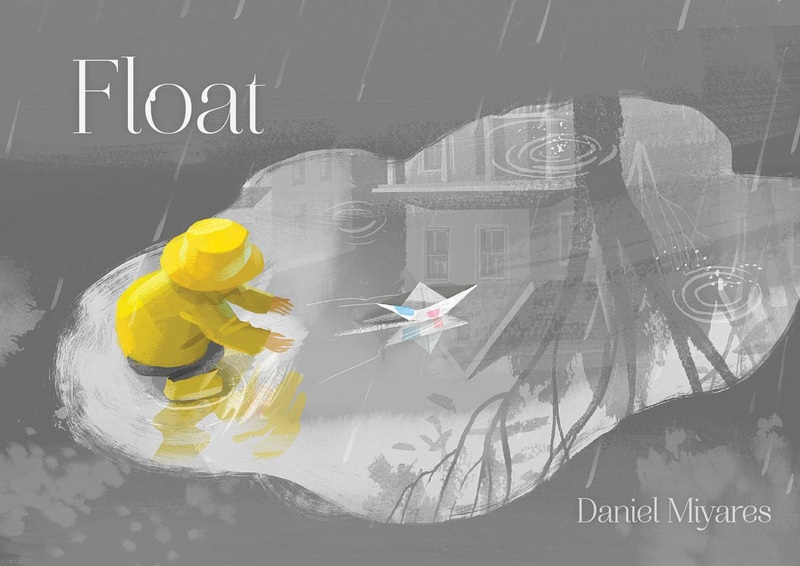 Float is the wordless story of a boy who takes a boat folded from newspaper out to play. When the rain starts, he floats it in puddles and in the gutter, but the boat gets away from him and ends up destroyed. Dejected, he trudges home holding his water-soaked paper. But, with a little comfort and help from home, he is soon off on a new adventure. The gorgeous illustrations are filled with movement and the exuberance of childhood play. Ink and watercolor backgrounds in shades of gray with a just a hint of color make the pages look as rain-soaked as the boy's adventure, and his rain jacket in brilliant yellow foreshadows the final scene while keeping readers' attention focused on the boy. Varied perspective, perfect pacing, and impeccably-placed page turns make this one of my favorite picture books of the year. If you are looking for a fabulous and funny new read aloud, Wolfie the Bunny is it. The Bunny family finds a baby on their doorstep. A wolf baby--an adorable wolf bunny. Dot, the bunny daughter is understandably concerned. "He's going to eat us all up!" "But Mama and Papa [are] too smitten to listen." Oblivious to any danger, her parents take pictures and dote on their new son, Wolfie, as Dot continues to warn them: "He's going to eat us all up!" Dot's persistently annoyed expression makes her all the more delightful, and her feisty protestations make for some of the funniest moments in the book. In a twist at the end of the story, it's spunky Dot who proves herself the hero of the family. Adults will appreciate the tongue-in-cheek mocking of any parent who has even been "smitten" with a child, and kids will understand--and laugh at--Dot's frustration with her new brother. We all know Revolutionary War heroes like George Washington, Nathanael Greene, Patrick Henry, and Ethan Allen, but in Gingerbread for Liberty, we meet an unlikely hero--a baker. Christopher Ludwick was a German baker who owned a gingerbread bakeshop in Philadelphia. He had a big booming laugh and a kind and generous disposition. And he was a patriot. When the Revolutionary War started, the baker (who was too old and fat to be a soldier), built ovens and made bread at his own expense for the soldiers. Then, when England sent Hessian soldiers to fight the patriots, the baker volunteered to talk to them. Under cover of night, he rowed out to the Hessian army and convinced many of the soldiers to switch sides. Bits of humor in the text and art add a touch of lightness to this war story that will draw in young audiences. Paper cut-out illustrations resemble gingerbread cookies, creating stylized scenes that allow the baker's personality to shine through. An author's note at the end has additional information that you must read before sharing the book. This true story of the original bear named Winnie was written by the great-granddaughter of Harry Colebourn, the man who raised the bear, as a bedtime story for her son, Cole. Harry was a veterinarian serving as a captain in the Canadian military during World War I when he saw a trapper with a bear cub at a train station. He purchased the bear for $20 and named her Winnipeg (or Winnie for short) after his hometown. After Harry convinced his Colonel to let him keep the cub, Winnie became a mascot of sorts for the brigade and traveled with them across the ocean to England. But when the men had to join the fighting in France, Harry left her at the London Zoo. It was there that she was visited by Christopher Robin (son of A. A. Milne) who was allowed to play in Winnie's enclosure. 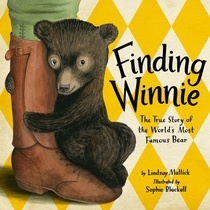 Their friendship inspired Milne's Winnie the Pooh stories. Beautiful illustrations by Sophie Blackall include panels, spot art, double-page spreads, and details that encourage readers and listener to linger over every page. Period photos decorate the final pages in scrapbook style. 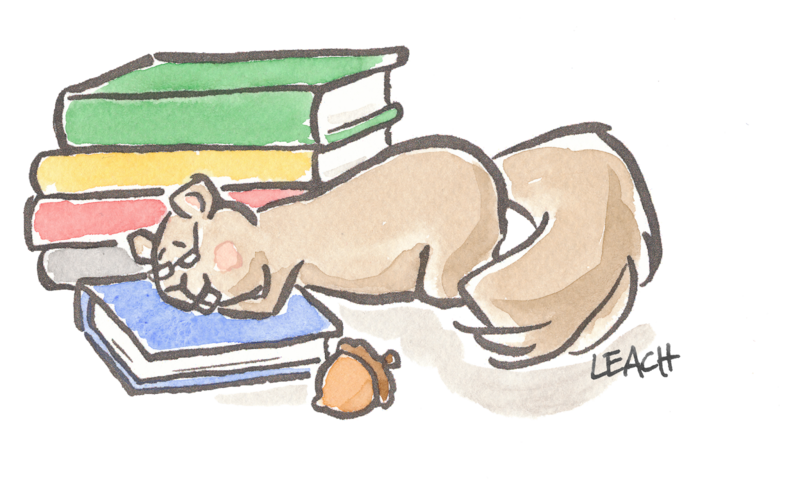 First, two of the best children's literature blogs are back in session. At Heavy Medal, Jonathan Hunt and Nina Lindsay look closely at Newbery contenders with ooh-I-wish-I-would-have-written-that posts. Their commentary is smart and thoughtful, and the comments provide a great forum to join the discussion. Calling Caldecott considers possible Caldecott contenders. Check it out to discover titles you may have missed, look at some the year's best books in a new way, and add your own two cents to the discussion. Second, the National Book Awards announcement yesterday of their longlist for Young People's Literature started--albeit unofficially--the awards season. Finalists will be announced October 14th and the winners will be announced on November 18th. Mark your calendars. Meanwhile, I am just waiting to get my hands on a copy of The Thing About Jellyfish. Tomato sandwiches, open windows, good books . . . happy fall. Laura Amy Schlitz is a talented writer and I am always excited to read her new books because of the unusual stories and well-developed characters. I was hooked when I finished The Night Fairy and I continued to be impressed by Splendors and Glooms, as they invited me into unique new worlds with details I hadn't experienced before. 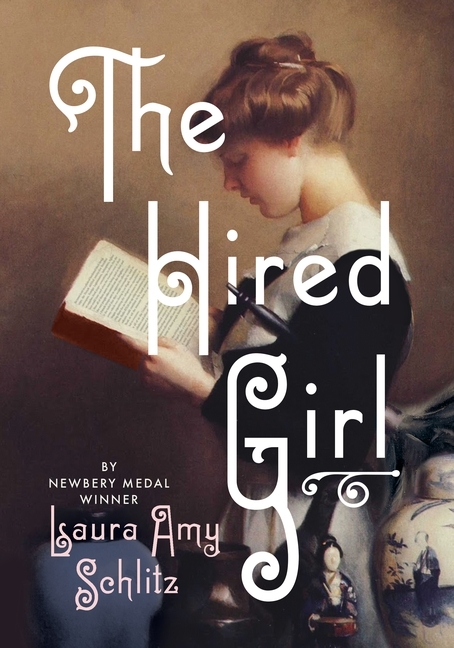 Her newest story, The Hired Girl, takes a more traditional twist and is set in the 1900's. While the setting is more familiar, this Americana romance explores some interesting issues of religious diversity, family ties and class distinction, all while embracing the foibles and resilience of human nature. 14-year-old Joan has not had an easy life, a life made even more difficult with the death of her doting mother and the cold resentment of her father. As the only woman on her father's farm, she is forced to leave school and become solely responsible for the cleaning, cooking, washing, gardening, mending and chicken tending. Her life is basically one of servitude and she longs to fulfill her mother's dream for her and become a schoolteacher, a wish not likely to come true under the hatred of her father and the heavy drudgery of farm work. She takes courage, however, after her father burns her beloved books and reveals all the ugly things he feels about her, and she runs away to become a hired girl. A kind stranger takes her off the street and, after changing her name and lying about her age, she is given a job in the Rosenbach's home. In this new household, she must work hard to please Malka, the old family housekeeper, and to learn all the strange new rules of a Jewish family. She also must navigate her emerging feelings toward Mrs. Rosenbach, kind but often disapproving, Mr. Rosenbach, who takes her under his wing, and their three children. The developing story shows her mettle, while also highlighting her youth and lack of relationship experience. Written entirely in Joan's journal entries, each passage is incredibly detailed, so much so that when dialogue is presented it feels more like a traditional first person narrative. The combination of styles works, but the length of almost 400 pages and lack of white space skews to an older audience. Fans of historical romance will appreciate Joan's girlish fantasies and the compelling characters and attention to detail is engaging. Review copy received from publisher. I have conflicting feelings about the month of May. First, I am counting down the days until school lets out. I look forward to summer days with no homework, no school projects, and no bell schedule. Summer is the time when I get to decide what to do with my children, and I love it. On the other hand, it also the last month of storytime at school, and I know I will miss the students I have come to know this year. I decided to wrap up the year with fables, folktales, and biographies. The Tree Lady: The True Story of How One Tree-Loving Woman Changed a City Forever by H. Joseph Hopkins, illustrated by Jill McElmurry. Mouse & Lion by Rand Burkert, illustrated by Nancy Ekholm Burkert. We talked about flattery and about morals. The students did a great job of articulating the lessons that could be learned from Mouse & Lion. "The Girl who Loved Danger" told using Steve Light's story box. I cannot recommend Steve Light's story boxes enough. They making storytelling fun for kids and adults alike. And I think it was the perfect way to end the year. Nursery Rhyme books are scattered throughout my shelves. I have several Mother Goose collections (including the essential Tomie dePaola's Mother Goose and Mother Goose's Storytime Nursery Rhymes by Axel Scheffler), Pocketful of Posies: A Treasury of Nursery Rhymes by Salley Mavor (one of my favorites), and several different versions of rhymes in the board book variety (including Tomie's Little Mother Goose). I definitely did not think I needed any more collections to stock my personal library . . . but I was wrong. 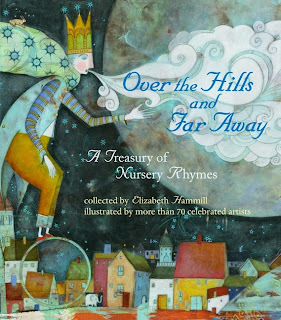 Over the Hills and Far Away is a Treasury of Nursery Rhymes that breathes new diversity and life into the genre. Collected by Elizabeth Hammill, it has the traditional rhymes that you would expect and look forward to, but as an added surprise, there is a healthy collection of lesser-known rhymes from all around the world. One particularly enchanting page comes early in the book, and really showcases the genius of this creative collection. I read it several times because I love how it compares, at a glance, the similarities and differences between cultures with one base rhyme. Four different versions of "Little Miss Muffet" are set side-by-side on the page (English, Jamaican, American, Australian) and reading them together is just fun. If you set the unique rhymes aside, this book is a must-have for the artwork alone. With over 70 different artists contributing their talents, each page is a new style and a surprise, with artists including Mo Willems, Ashley Bryan, Jon Klassen, Jerry Pinkney, and many more. There is certainly nothing boring or expected in these pages and the full color illustrations are simply beautiful. This is a grown-up collection of nursery rhymes that will still entertain young readers with clapping rhymes, riddles, counting-out rhymes, traditional rhymes and distinct illustrations. Even if you think you have seen it all, check this collection out and it is sure to find a space on your shelves. 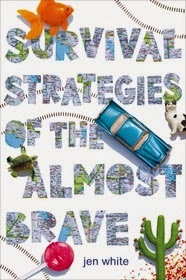 In today's post, debut author Jen White discusses her exciting new novel, Survival Strategies of the Almost Brave--a superbly-paced middle-grade adventure with memorable supporting characters and two unbelievably brave (and yet completely believable) sisters. After her mom dies, Liberty's father shows up in a camper to take Liberty and her younger sister, Billie, for the summer. At first, Liberty thinks things with her "gone-forever-but-now-he's-back-dad" might work out fine, but when he abandons the sisters at a gas station in the middle of nowhere, she realizes that they are on their own. As the sisters try to get to safety, some of Liberty's twelve-year-old decisions are ill-advised, but her loyalty to Billie never wavers. Q: Liberty and Billie have a wonderfully strong bond. Did you draw on personal experience to portray their relationship? A: I’m sure I did, although it wasn't a conscious decision. I come from a large family and we are all close in age. I have two sisters and two brothers. I am the oldest, so the bossy, controlling part of Liberty I came by naturally. I also have my own children. Although, I do feel like Liberty and Billie are their own creations. When I wrote them I wasn't thinking of a particular person or persons. They came alive as I wrote and after I finished my first draft I felt like I had a really good handle on who they were and how they behaved. Q: Liberty and Billie cross paths with several interesting characters—do you have a favorite? A: In some ways they are all my favorites. There’s a true emotional connection behind each character. I would say I really loved Star Wars Kid (Roger) and didn't want his story to end. I hope I can create some form of Roger again in my future writing. I also loved Lavender Lady and Orson. They made me laugh and were a great duo to write. And finally, I’d say, I loved Tattoo Guy. I love him because upon first observation he seems intimidating and scary, but as the book progresses we get the whole picture of who he is (compassionate, funny, and smart). In the beginning he is not who he seems. In general, I think this is true of most people. There is so much more to a person than what we see on the surface. Deep down everyone has a story that we can relate to. Q: Your story presents mental illness with delicacy and candor. Was it difficult to achieve that balance? A: Thank you, I’m so happy to hear you say that. I worked very hard on those scenes and wanted them to feel right. I would say the moments with Liberty and Billie’s dad were my most difficult to write and I spent most of my time on those scenes trying to make them feel real. People deal with mental illness daily— trying to cure it or contain it, as well as trying to accomplish everyday tasks such as how to: work, sleep, eat, take care of children, get an education, find someone to love, etc.. In many ways mental illness can feel like business-as-usual for the people who live with it or for people whose loved ones struggle, so I wanted, at times, what was going on with dad to feel both comfortable and uncomfortable to Liberty and Billie. Obviously, in the book, their dad needs help. The girls need to get over the dream of who they want him to be and come to terms with who he really is. They also need to get to a place in the book where they recognize he is not behaving normally. Sometimes mental illness isn't entirely obvious until, when suddenly, it is. Q: What is the hardest part of writing for you? What is the most rewarding? A: Right now I can pinpoint two hard parts. First, forcing myself to create time to write can be difficult for me. My family is still all at home, so there are many needs at my house. I am one of the primary people who take care of those needs, so time is my enemy. There is a constant struggle between things that need my immediate attention and also my writing (which also needs my attention, but it doesn't always feel quite as urgent). When I am not getting my writing time I turn very cranky. At my house we have this game, Table Talk, that we play at dinnertime and one of the questions is: If you could be a super hero what quality would you have and why? I always choose the ability to stop and start time. My kids think that is the WORST super hero power ever. But wouldn't that be awesome? I dream of having all the time in the world. Second, I think the hardest part in a manuscript is generally the middle…I would say around page 130 is where I start to slow down and feel stuck. That’s because I don’t use an outline as I write. I’m a seat-of-my-pants kind of writer, so the middle always gets difficult because I have to make important decisions that affect the ending. I hate middles. The most rewarding part of writing is reading a scene you just wrote and think, wow! I kind of like that. In fact, I like it a lot. That feeling is addictive. Q: This is your first published book. Were there any surprises along the journey from idea to publication? A: Yes, there were surprises. I remember going to a marketing meeting at FSG/Macmillan after the book was first bought and someone asked, “Do you have any questions?” And I sat there trying to think of an intelligent question when I finally said, “I’m sorry. I don’t know what I don’t know.” Now, two years into the publishing process, I think I would have better questions. Another surprise is once your manuscript is bought by a publishing house is takes a REALLY LONG time to hold that book in your hands. It just does. There’s no real way around it. Also, I didn't realize how much I was going to need and rely on my agent who has turned out to be a really amazing person, so I lucked out there. When I was making my agent choice, I didn't realize how important that relationship would be, and I have been pleasantly surprised. The same is true for my editor. I have learned so much from her. It’s great to work with people who love my book almost more than I do. The publishing world is really quite small and I think it’s important to surround yourself with great people, and in turn, be good to the people around you. Thanks Jen, for taking the time to tell us a little about yourself and your book. I'm looking forward to reading your next book, especially if you tell us more about Star Wars Kid's story. You can read more about Survival Strategies of the Almost Brave and read the first chapter at Jen White Books. Pick up a copy of your own when it comes out on June 9. In my neck of the woods, April was filled with the craziness of bunnies, blossoms, and snow. This month's storytimes reflect that. 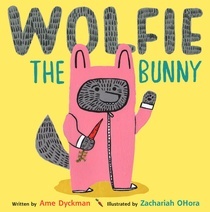 Wolfie the Bunny by Ame Dyckman, illustrated by Zacharia OHora. Wolfie the Bunny was huge hit. One boy, in particular, laughed at almost every page turn. That's a keeper! Coyote: A Trickster Tale from the American Southwest by Gerald McDermott. We had a spring snowstorm which seemed like the perfect time to share Rabbit's Snow Dance, and the Native American folktales dovetailed nicely with what the students were learning in class. Trapped! A Whale's Rescue by Robert Burleigh, illustrated by Wendell Minor. I'm not sure the shark poem entirely fit with the whale theme, but I love sharing this poem during National Poetry Month. The two books about whale rescue provided an interesting contrast, not just because the rescue methods were different, but because Humphrey trapped himself by swimming up the river, and the whale from Robert Burleigh's book was trapped by human-made nets. My Favorite Things by Oscar Hammerstein, music by Richard Rodgers, illustrated by James Warhola. Then each week we talked about some of my favorite authors and illustrators, past and present. "Sick" by Shel Silverstein, from Where the Sidewalk Ends. Just as I was wrapping things up and heading out the door, I got a request to read "Boa Constrictor." Unfortunately, we were out of time--I'll have to find a way to incorporate that into an upcoming storytime. "The Case of the Silver Fruit Bowl" from Encyclopedia Brown Keeps the Peace by Donald J. Sobol. Before reading the solution at the back of the book, I asked the students if they thought they could solve the case. They are pretty observant third graders and had some great ideas. Milo's Hat Trick by Jon Agee. And I'll ask again what I always ask when I talk about Milo's Hat Trick: Why is this fantastic book out of print? Bring it back. Please. "By now I think you know what happened to your sandwich. But you may not know how it happened." Does this grab your attention? If these opening lines haven't hooked you, the rest of The Bear Ate Your Sandwich certainly will. "It all started with the bear." Elaborate details take you on a bear's journey out of the forest, via a berry truck, into the city, and ultimately to an abandoned, delicious sandwich on a park bench. During the exciting adventure, funny details delight as the bear explores the city and this new "forest" becomes his playground. Readers should find particular amusement in the "trees," "bark," and especially the squishy "mud" that is actually wet cement. Soft, gently blurred illustrations created with acrylic paint and pencil lend an abstract feel while showcasing a distinct personality to a very real, curious bear. The playful artwork happily displays the bear frolicking in the park, bathing in a fountain, and splashing in puddles, right next to curious, yet oddly unconcerned, children. The story is funny and charming with bright, happy pictures, but the unexpected Klassen-like twist at the end is what makes this book special. If you haven't read this one already, be sure to pick up a copy and enjoy. 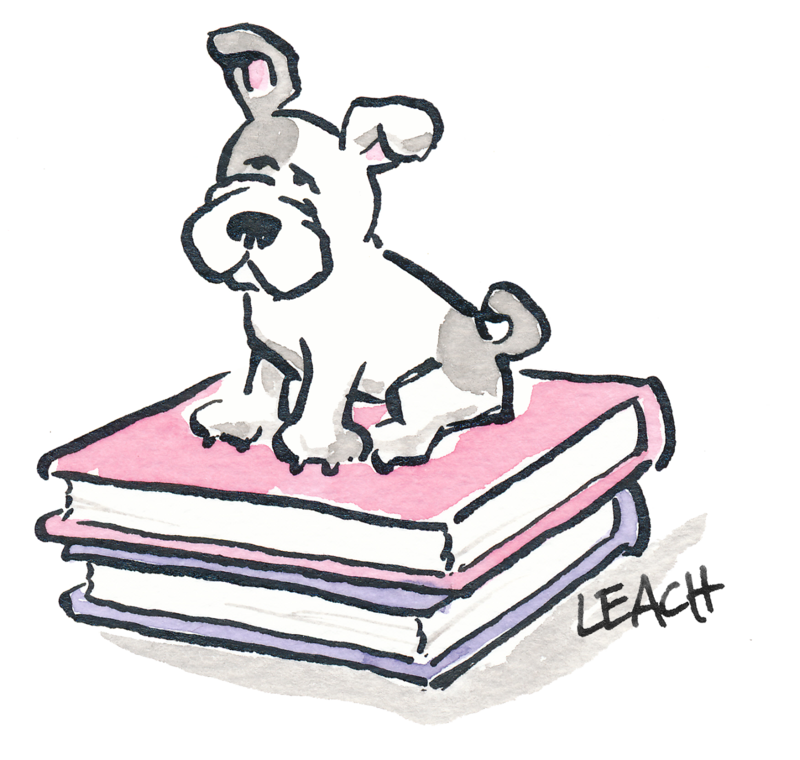 American Library Association Awards, Chinese New Year, and storytelling -- there was much to talk about in February and great stories to read. The Adventures of Beekle: The Unimaginary Friend by Dan Santat. I pulled out other award-winning books from 2014, and a cheer erupted when I announced that Sam & Dave Dig a Hole (by Mac Barnett and Jon Klassen) had been given a Caldecott Honor. Yep, they liked that book. "The Fox Borrows the Tiger's Fierceness." After hearing "The Fox Borrow's the Tiger's Fierceness," one boy commented on the story's similarity to The Gruffalo by Julia Donaldson. Similar it is. I used Steve Light's storybox to tell "Little One Inch." (When you look at the storybox, be sure to watch the video of Steve Light telling the story. Brilliant.) When I finished, a girl said, "Oh that was great! If you were doing the storytelling festival, you would win." All credit for that goes to Mr. Light. Thank you, sir. As an added bonus, I overheard my five year old telling the story this week with her brother's dinosaurs and bear. "Lemme out! Lemme out! Lemme out!" Gingerbread for Liberty! : How a German Baker Helped Win the Revolution by Mara Rockliff, illustrated by Vincent X. Kirsch. I loved pairing these books because while the art and storytelling styles are different, the themes are similar. And the students loved the stylized art in Gingerbread for Liberty! It was a great way to end the month. Things have been awfully quiet around here lately, but I'm still here and resolving to get back to more regular posting. Today is Chinese New Year and the perfect day to share a Chinese story, so share this story (adapted from the Record of the Warring States) or a favorite of your own. Tiger was hunting in the forest when he spotted a fox just walking around minding his own business. Mmm, thought Tiger, that fox looks like he would make a tasty snack. And springing with his powerful legs, Tiger pounced and caught the fox under his large paw. Fox knew he was in grave danger, but not wanting to be someone’s dinner and being very clever, he thought quickly. “How dare you attack me!” he cried. Now Tiger didn't really believe that Fox was king of the forest, but the little fellow spoke so loudly and so boldly that Tiger wanted to see how the experiment would go, so he released Fox. Then, Fox, holding his head high, proudly walked deeper into the forest with Tiger right behind him. After they had gone a short way, Fox called, “Hello!” to a rabbit that was munching on grass. The rabbit caught sight of Fox (which was frightening enough), and then he saw Tiger following closely behind. The rabbit’s eyes grew wide, and his ears began to tremble, and he hopped quickly away into the long grass. Of course that little rabbit would run from Fox, Tiger thought. Fox would eat him if he got the chance. So with Tiger still suspicious, the pair walked even deeper into the forest. “Hello,” Fox called to a monkey that was chattering in the tree tops. The monkey swung down to chatter at Fox, but when he saw Tiger, his eyes grew wide and his tail began to tremble, and grabbing a kudzu vine, he swung away through the trees. Tiger thought, Perhaps Fox is fiercer than I supposed. Still, he can’t possibly frighten all the animals and be king of the forest. The two continued walking and hadn't gone much farther when Fox called, “Hello!” to a boar that was wallowing in the mud. “Ugh,” grunted the boar, and looking up, he saw Fox with Tiger walking after him. The boar’s eyes grew wide, and his tusks began to tremble, and he crashed off into the underbrush leaving a trail of mud behind him. That is surprising! thought Tiger. Boar is afraid of Fox. But before he had time to wonder at the strangeness of it, Fox was greeting a crocodile sunning himself by the river. “Hello,” called Fox. And the crocodile turned to snap at the little fox for bothering him while he was enjoying the afternoon sun, but seeing Tiger made the crocodile’s eyes grow wide (just a little), and his thick leathery skin began to tremble (just a little). And the crocodile slunk slowly into the river and swam away. Tiger had to agree it was true, and bowing his head, he turned and left Fox to rule over his forest. And that is how Fox borrowed the Tiger’s fierceness. Snow, snow, and more snow--that's what we should be seeing in my neck of the woods around this time of year. Even though I didn't even pull my snow shovel off its hook in January, that didn't stop me from pulling some snow books off my shelves. Earmuffs for Everyone: How Chester Greenwood Became Known as the Inventor of Earmuffs by Meghan McCarthy. Earmuffs for Everyone reminded one student of a book we had read a few months ago--Pop! : The Invention of Bubble Gum. He was pretty pleased with himself when I pointed out that both were were written and illustrated by Ms. McCarthy. Snowflake Bentley by Jacqueline Briggs Martin, illustrated by Mary Azarian. I think those selections left us lamenting our lack of snow, so the next week I changed plans. The Bear Ate Your Sandwich by Julia Sarcone-Roach. We considered the stories' narrators, and compared them to the narrator in a book we had read previously--Jon Klassen's This Is Not My Hat. If you haven't seen The Bear Ate Your Sandwich, go find a copy now. You can thank me later. We looked at the illustrations and talked about the upcoming ALA Youth Media Awards. I can hardly wait for next week to share some of the winners! Well, I've read my last YA nonfiction book, for this year at least. Serving on the Young Adult Nonfiction panel for the Cybils has kept me busy for the past few months, and you can see the finalists for that category and all the Cybils categories on their website. Happy reading! (c) 2012. All rights reserved. Original content may not be used without permission. Simple theme. Powered by Blogger.